China Sojourns Photography (作客中国摄影) is a simple project that started where I would post photos from China and around the world. From a small town in the USA (Pendleton, Oregon) to living in international cities (Hong Kong, Beijing), there were many different paths I have taken with much to do, to see, to contemplate and in the end to experience. While the focus is on photography, there will also be occasions when the mood strikes that philosophy via photography will be combined. Often I believe that while writing & photography are both solitary pursuits, it is the inspiration of others that allows me to create: the sharing of ideas and learning. A mutual exchange of ideas and inspiration. As such, the theme for this site will be “us”, two souls dancing and learning as we move forward in life. There is no direct translation of 缘分 (yuan-fen) to English. It is often link to Buddhism and karma and defined as ‘pre-ordained affinity/fate/destiny’, where destiny awaits your action when opportunities arise. This means, that while it may be fate two people should meet, whether they stay together is up to yuan-fen and destiny. Yuan (缘) brings two people together, and Fen (分) is the work necessary to fulfill this destiny. When you choose to take or forego an opportunity, 缘分 (yuan-fen) has arrived and depending on your commitment, becomes a part of your life forever. Through contemplation & through the lens of a camera are where many of my ideas of life are created. The constant search to find a choice moment in time where an idea will transpire via words or a photo to bring inspiration is a daily goal. I see inspiration every day in the people I know. Ideas are what keeps us dancing. My blog is award free. So much thanks and a great amount of respect and admiration for those who read & share with me. It is a great community of inspiration and understanding. Inspiring and genuine – wonderful place! We would like to obtain permission to use one of your photographs. Can we contact you directly via email about the matter? Thank you. Dear Kim, yes you may contact me via email at randall@pcfchina.com. Have a great summer, Randall. I find what you have written quite interesting! have a great day! Thank you for your visit and your input. Life is a beautiful journey and your photography reflects it. A great journey indeed ~ thank you! I take great delight from this. Both the idea of the call and response between destiny and work and the connection between visual symbols and an inner receptivity are very meaningful for me. I have experienced both and found that when I miss the call or symbol, it is repeated. Finding your blog is a timely blessing. 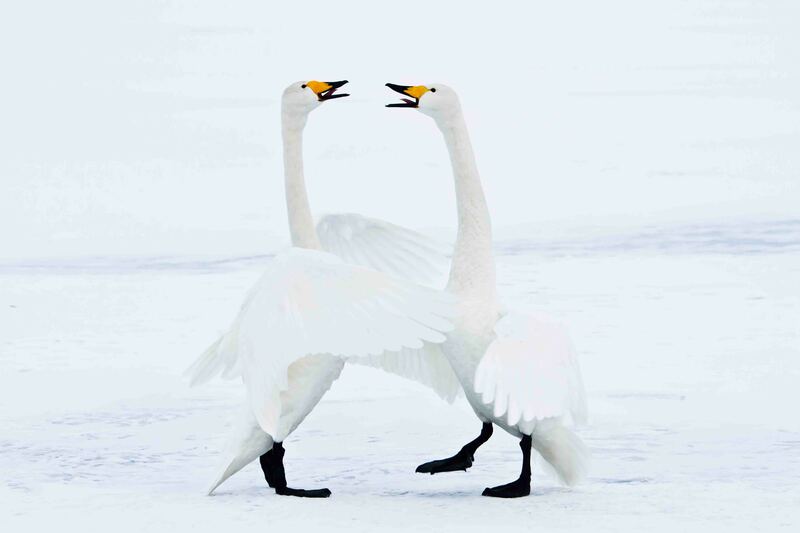 I know those swans must be putting on a mating display, but somehow to me they look more like two relatives at an airport meeting again after far too many years. Perhaps I’ve just witnessed that scene so many times I now see it everywhere. Your photography and your writings, like a long-married couple, are finishing each other’s sentences. Beautiful blog! Is it possible to contact you via email? I have just completed my first book and I was keen to discuss the idea of using some of your photography for my front cover. My email is naaron2@hotmail.com. Hello! I love your photo of Ty Breuer! Is there anyway I can get a copy of it? Yes, I will send you the photo. Hey Randall, thank you for stopping by my blog (again). You left a comment there but I prefer to respond here. Happy New Year to you too. I look forward to seeing more of your photos. I know it’s not just me, that you bring your readers to where you’ve been by the photos you share here so keep going. Until next post. Thank you very much Ruby Anne, it is nice to know you also travel along with my photos and words ~ wishing you a great year ahead. Your photography is truly a work of art. Love the way you weave philosophy and words with your visuals. We stayed in China for a month, Shanghai mostly, but managed to visit Beijing for a short span of time. Look reading your posts and discovering a side of China – we probably missed seeing. Thank you very much ~ for me writing and photography seem to blend well with each other and my travels. Your photography tells a story by itself. The photos you show on your blog are very moving as they show people as they are. Thank you ~ it seems that photography is a great way for me to enjoy travels better as it leads me to get to know the people/culture of the area a bit more than if I was just to pass on through. Thank you Michelle. may i use some of your pictures for my assignment..
Great project you are doing and best of luck. Hello Randal. It’s Vergielyn. Just dropping by to say hi and hope all is well on your end. http://www.copywritingbrat.com is the site I now reside. Any chance you’ll be back to the Philippines soon? Hello Vergielyn, great to hear from you! Things are going well, getting back to writing and photography 🙂 Hope to get back to the Philippines very soon, truly is a slice of heaven! Hi Randall. Great to hear from you again as well. Let me know when you are in the Philippines. By the way are you on Facebook?